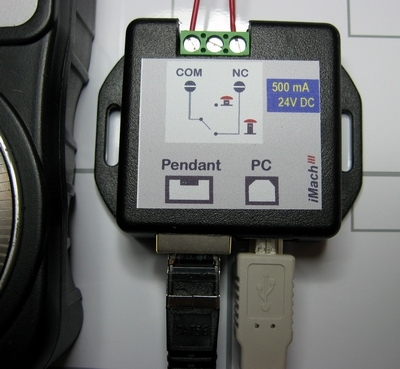 VistaCNC iMachIII USB Control Pendants are truly Plug 'n Play devices! 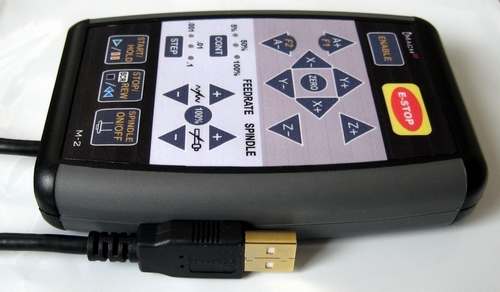 Work with parallel port controller, USB and Ethernet based controllers for metal, wood, plasma and foam cutting applications. 3 jogging modes: accurate Step , silky-smooth Velocity , and constant Continuous . 100 step (click) per turn, high precision MPG with stainless steel encoder disk. LCD with bright backlit . It was dead easy to install, responsive, and configuration is very simple. It actually worked satisfactorily right out of the box without any configuration at all. Models support Mach3:M1, M2, P1A, P1A-S, P2-S, P3A, P4-S. Files to upgrade P1A-S and P2-S to Mach4. Files to upgrade P4-S to Mach4. VistaCNC pendants support LinuxCNC on 32bit OS and 64bit OS . Files to upgrade to LinuxCNC. Files to upgrade to UCCNC. VistaCNC pendants support Machinekit /BeagleBone (ARMv7). Files to upgrade to Machinekit. Packed with all the jogging functions. 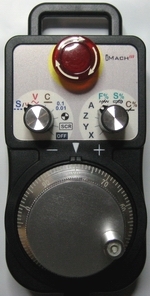 Small size buttons with LEDs for each operation. Predefined number quick selection for Step Size, Feed rate, Spindle speed and Slow Jog Rate. 5 control buttons + 3 function buttons. 4 axis Step and Continuous jogging. Step size and jog rate indicators. through E-Stop button in the pendant.